So, here we are some 5 months after Lightroom Beta 1 was released to the public and the long awaited Beta 3 has finally arrived. I've been privileged to use Beta 3 in one form or another over this past few months, so I'm very pleased to be one of the first to summarise the more significant changes. The list of new features and enhancements highlighted above might appear short, but appearances can often be deceptive. That said and before discussing the new features, I think it's important to reiterate some of the comments made by Adobe at the time Lightroom was first announced. Firstly, and even though some pundits seem hell bent of declaring the opposite, Lightroom is not a rushed reaction to Aperture. OK, so Lightroom was announced after Aperture with many core features missing, but that doesn't make it a reaction to Aperture. Lightroom is still a work-in-progress project. Missing features doesn't mean that they won't be included in the final product, more likely that they aren't yet ready for the public beta. Also, whilst modules such as Print are virtually complete others are still very fluid. For example, participants of the Lightroom forum will note that a module named Describe, which was previewed at various Epson Print Academy events over recent months is nowhere to be seen in the public version of Beta 3. So, what's the Describe module and why is it not included? The Describe module is dedicated to metadata entry, but still requires a lot of work, so the Team have decided not to include it with this beta release. Now we get back to what has been included in Beta 3. When you first launch the Lightroom after installing Beta 3 you'll see an alert dialog which indicates that your existing library is about to be updated, and that this could take a few minutes. If you have many thousands of images in your library the actual time can be quite lengthy (10 minutes plus is not uncommon). Fortunately, the library only needs to be updated once. When the library update is complete the application will launch and you'll be greeted with an enhanced UI. The more observant will notice that the panel headers have a more rounded appearance and some new buttons added to the Status Bar. Other buttons have been repositioned or removed altogether. The functions associated with removed buttons are now accessed via the menus or keyboard shortcuts (e.g. Export (Cmd+Shift+E) and Import (Cmd+Shift+I)). The screen modes such as Lights Dim, Lights Out, Full Screen with Menu bar and Full Screen remain virtually unchanged from the previous betas. Hitting the "L" key cycles through Lights Dim and Lights Out, and hitting the "F" key cycles through Full Screen with and without the Menubar. I don't want to dwell too much on the obvious, so you'll forgive me for moving onto more important features (i.e. those requested by users during during Beta 1 and 2). For example, Watched Folder support - one in the eye for those who said the developers weren't listening! 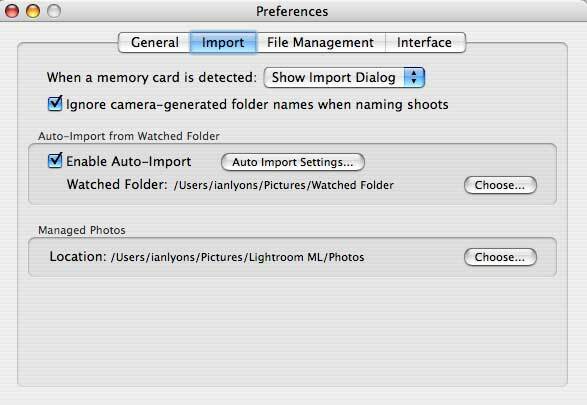 In the Import preferences, you can set the Auto-Import to automatically import images into a specified folder. Import Module - defining the "Watched Folder"
The Team have also provided fields for Naming images, Keywords, appending Development Presets and Metadata. No doubt a few users will find some aspect that doesn't quite match with their specific workflow, but the functionality that has been provided will far exceed the expectations of many more. So, assuming your camera has the facility for Tethered Shooting you're all set for automatic import from the camera directly into Lightroom. 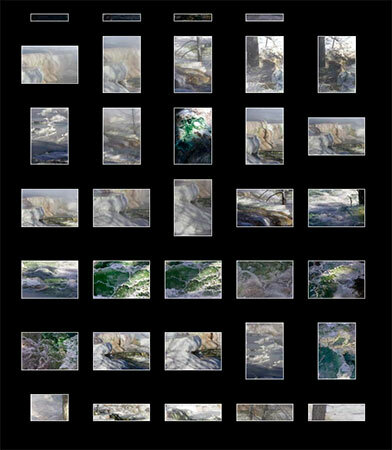 I've tried the feature with my Canon EOS 1DM2 and it works well, as does dragging and dropping of existing image folders. This next screenshot shows the modified module selection and thumbnail preview panel as it appears when the Library module is selected. The most obvious changes are the addition of a dedicated Web module (more later), a 4:1 zoom ratio, and repositioning of the EXIF data in the Quick Develop panel. Hopefully, 2:1 zooming will be added some time in the near future. Also, as mentioned above, Quick Develop now sports a simplified version of the Crop and Rotate tool. Crop takes the form of a popup menu with options for preset and user definable aspect ratios. 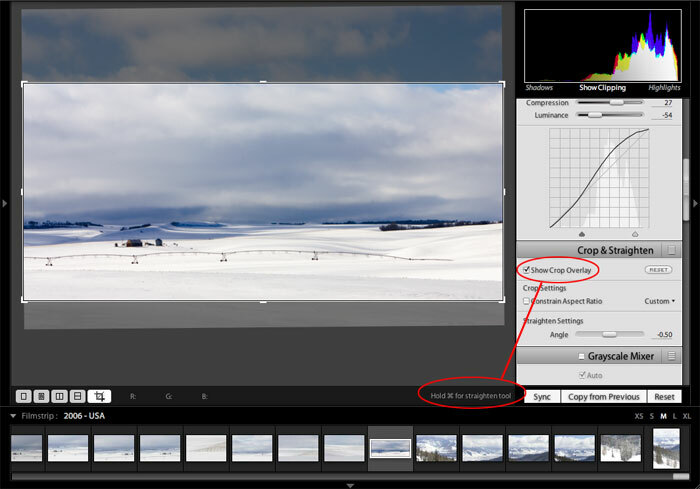 The Sync Crop Angle button enables the crop rotation angle associated with the most selected image to be applied to multiple selected images. The actual rotation angle is applied using the Rotate tool found within the Develop module. Another popular feature request dating back to Beta 1 was for the inclusion of a Hierarchical keywording system. However, even though it was included in Beta 2 many users still asked that it be provided; with some going as far as to say it was a make-or-break feature. Why they kept "banging the drum" for a feature that already existed is a bit of a mystery, but they did. Anyway, hierarchical keyword support is still included in Beta 3, but it now functions differently to Beta 2. So, what's the difference? Well, Beta 3 uses the concept of "explicit" keywords whereas Beta 2 (and most other similar applications) use "implicit" keywording. I show an example of hierarchical keyword system below. Example keyword being entered as a "Child"
Using above example: with "implicit" keywording assigning "Bison" to an image would automatically assign "Wildlife", whereas only "Bison" is assigned with "explicit" keywording. Something tells me that this change (hopefully only temporary) is going to result in some very negative feedback. The important thing here is that keywording is not finished and the development team are still very much open to user suggestions, which should be made via the Lightroom forums. Fortunately, as the following screenshot shows, the hierarchical structure is created, it's just not applied in the manner most users are familiar with. Another sign that the development team has been paying attention to user feedback is demonstrated in the way new Shoots are created. If you select an existing Shoot then press the "add (+)" button to create a new Shoot a small dialog is opened and you're offered the opportunity to make the new Shoot a Child of the selected Shoot. You're also able to move any already selected images into the new Shoot. 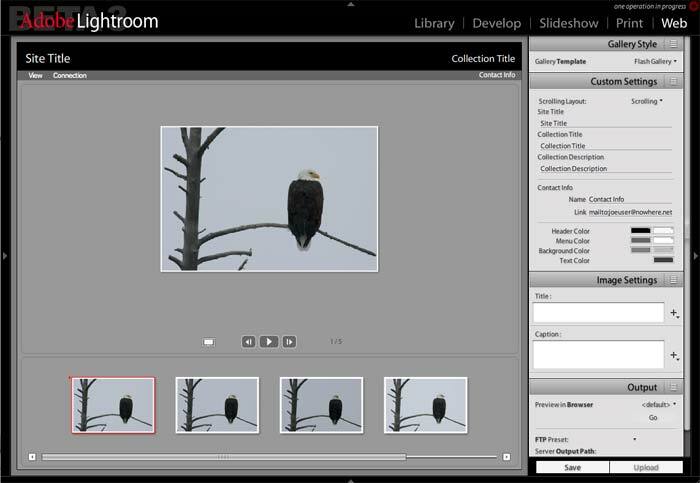 Many have asked for better Rating filters and the ability to manually sort their images (i.e. shuffle mode). Both features have been included in Beta 3, and will likely see further improvements in the future. The Rating Filter now has options to filter out images on the basis that they've been given a rating that is: Higher, Lower or Only "n" number of stars. For now, Manual Sorting is limited to simple drag and drop within the selected Shoot (i.e. you must not have Entire Library selected). The last item I want to mention for the Library module is how Lightroom handles off-line storage. From the outset Lightroom has supported off-line storage, but it wasn't easy to find. Beta 3 has introduced some changes that make it a bit more accessible and therefore easier to use. Nevertheless, I can see many users not even realising that the feature exists. At first glance little appears to have changed in the Develop module but don't be fooled. OK, so the image editing tools haven't seen any obvious changes, but other aspects of this module have been significantly enhanced. Image adjustments will appear somewhat faster than in previous betas, but there is still some further performance tuning to be undertaken.. The Crop and Rotate tool was first introduced in Beta 2, but like many Lightroom features it was only partially finished. With Beta 3 you now have the ability to Straighten an image by drawing a straight line between two points. Using the feature is fairly easy - activate Crop Overlay, hold down the Cmd key, click the start point for the line, then drag the mouse to define an end point. If you're familiar with the Ruler tool and arbitrary rotation in Photoshop you'll adapt to this automated version very quickly. I now come to the most interesting enhancements within the Develop module. Folk participating in the Lightroom forum made a strong case for Before and After views. These views would allow them to compare an edited version of the image against the original. The challenge wasn't so much how, but how many different ways could this be done. Given there wasn't any real consensus on the best way the development team have given us virtually every option they could think of. The screenshot below shows the enhanced Status Bar in the Develop module. With a new set of buttons you can now select the original (Before view) by itself, the edited version (Loupe view), a Left/Right comparison of Before and After, plus a Top/Bottom equivalent. Although I haven't shown it on the status bar screenshot there are additional buttons that further enhance this feature. 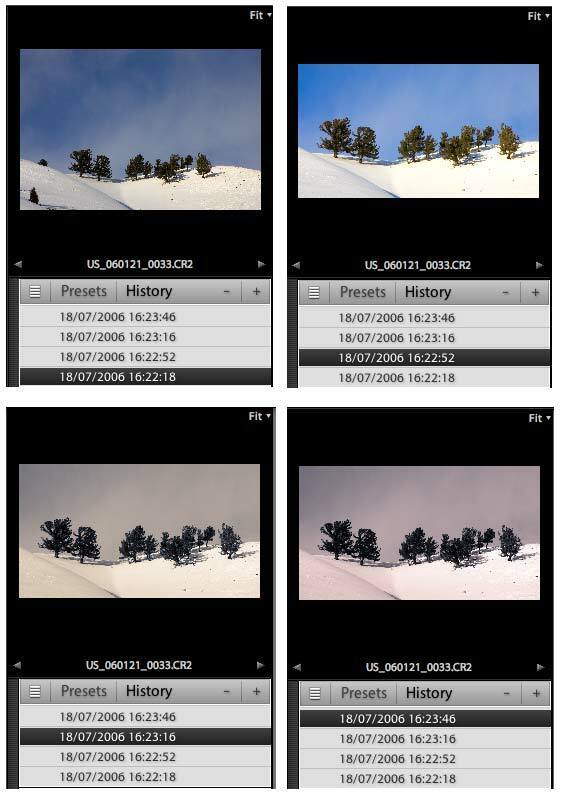 The following screenshot shows a standard 1:1 Before/After view of an image in Left/Right view. A similar view is also available for Top/Bottom views. Before/After views also support Live (Real-time) comparison of image adjustments, etc. A quick method of toggling the Before/After view is to use the "\" (i.e. backslash key). The second arrangement (shown below) allows the user to compare an identical view of the image with and without edits. However, using the Split Screen toggle it's possible to simply split the image into two halves, thus providing even more options for comparing the effects of image adjustments in real-time. Also, on the Status Bar, and just to the left of the split screen toggle are two buttons that allow you to copy the settings from the Before image to the After image or vice versa. It's an interesting option, but I think some users will take a while to figure out a use for it. When you switch to Before/After view the Hand (Zoom and Pan) and White Balance tools will disappear. However, both Pan and Zoom are still accessible by clicking the image to Zoom or holding down the mouse button to Pan. Pressing the Space Bar also acts as a Zoom toggle. The Crop & Rotate button on the status bar can be used to activate the Crop Overlay (keyboard shortcut is R for those who don't like buttons), but it can't deactivate it, which is a pity. Also, notice that an R-G-B readout is now available, although the values are quoted in % terms rather than the more usual levels values. Avoiding levels values gets round the problem that occurs when you're working with 16-bit images where the normal 0 to 255 doesn't apply. However, my guess is that there'll be ongoing requests for a conventional levels based R-G-B readout. 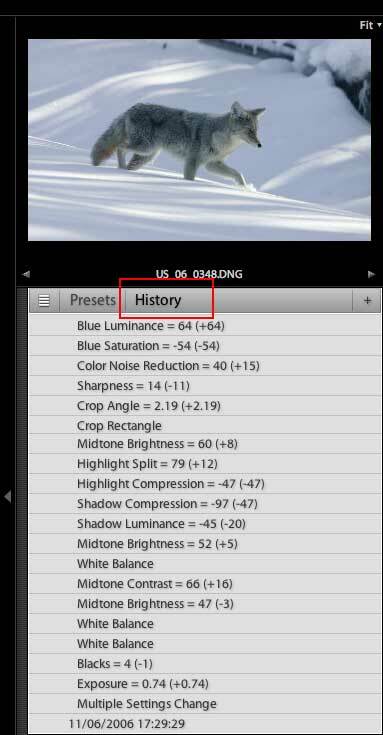 The screenshot shown below shows the new History feature nested within the Presets panel. I find this arrangement a bit confusing, but consideration is being given to breaking it out into its own panel. The History panel automatically records each adjustment as you make it and is a much more useful (read powerful) feature than I had expected. As noted above, the History panel automatically and independently keeps track of the changes applied to each image, so selecting any line in the History panel will return the image to the edited state at that point in time. By hitting the "Add (+)" button at the top of the history panel a History Checkpoint is created. This checkpoint actually collapses the current history states into a single user history state (similar to Photoshop snapshot). The checkpoints can then be used as "pseudo-Versions or Renditions", meaning that a single RAW image can have multiple "renditions" (i.e. one image with multiple sets of settings denoted by the history date/time stamp in above screenshot). Double clicking the date/time stamp checkpoint will allow you to edit the checkpoint so that it has a more readily recognisable name. You can then hover the mouse backwards and forwards over the checkpoints, whilst at the same time watching the effect in the Navigator preview. Once you see the version you're looking for simply click the relevant date/time stamp or checkpoint name and the main preview will reflect the settings that had been saved into the history checkpoint. The following screenshot is an example of this technique being put to use. The screenshot shows the original image along with 3 other "renditions", each of which is based upon a sequence of edits involving amongst others: Exposure, Brightness, Contrast, Split Tone effects, and Cropping. 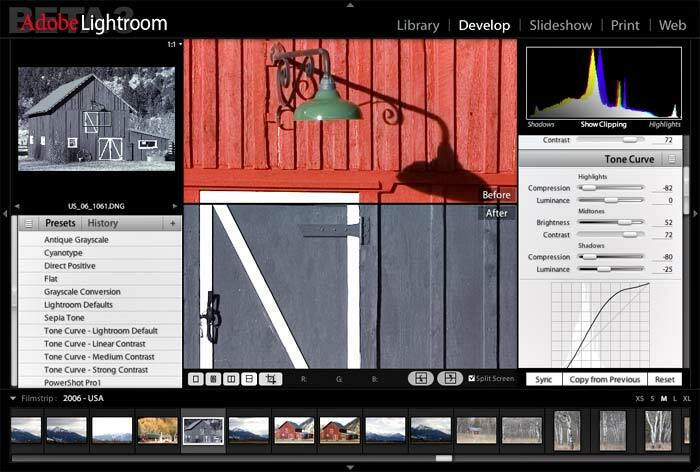 Lightroom interoperability with Photoshop CS2 has also been improved, and a few bugs have also being fixed. 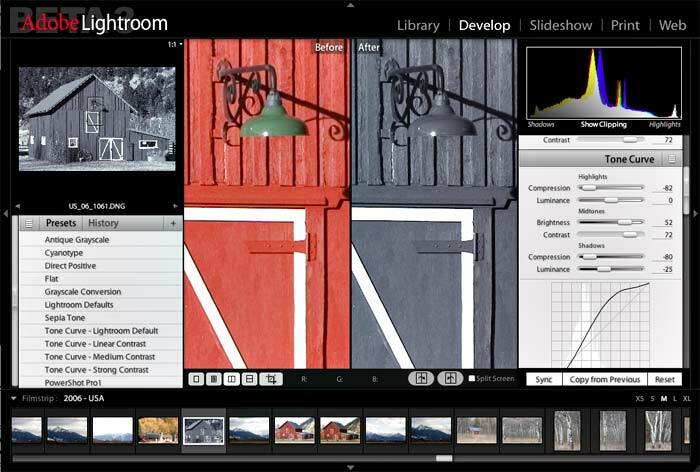 Lightroom creates a 16-bit Tiff copy of images before launching Photoshop, and when the edits are being saved via Photoshop the user can save the image back into the Lightroom library. The main advantage of using this method of exporting images is that it keeps the edited TIFF file within the library, which should mean that you don't have to re-import it back into Lightroom when you've finished editing it in Photoshop. Another very welcome feature is that Lightroom now provides the user to define the Size and Resolution of images within the Export dialog. Although the screenshot shows the output specified in pixels it's also possible to define it in centimetres or inches. 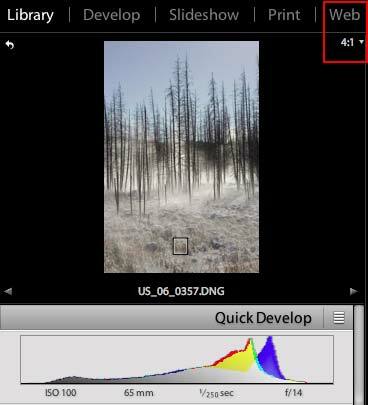 Obviously Lightroom will up/down sample the image to match the size and resolution specified. The Print module also includes some very useful enhancements. 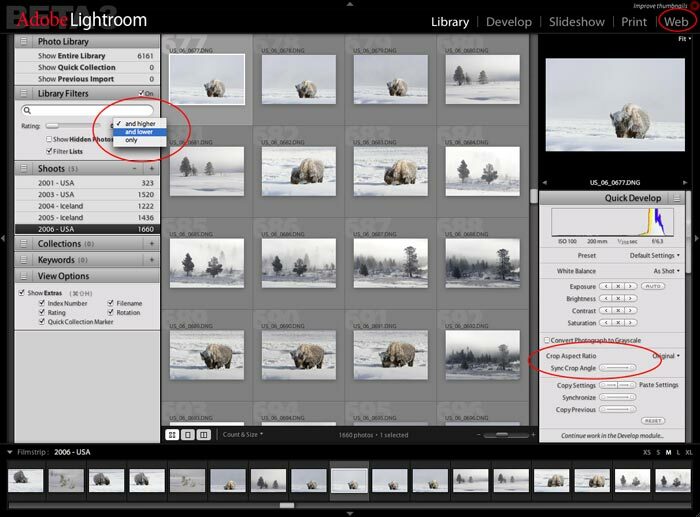 For example, followers of George Jardine's Lightroom Podcasts will probably recall members of the Team discussing the possibility of a One-button Print feature. Well, it's included with Beta 3 and works extremely well. I have included a screenshot showing the list of Print Templates that I've configured for my Epson R2400 printer. 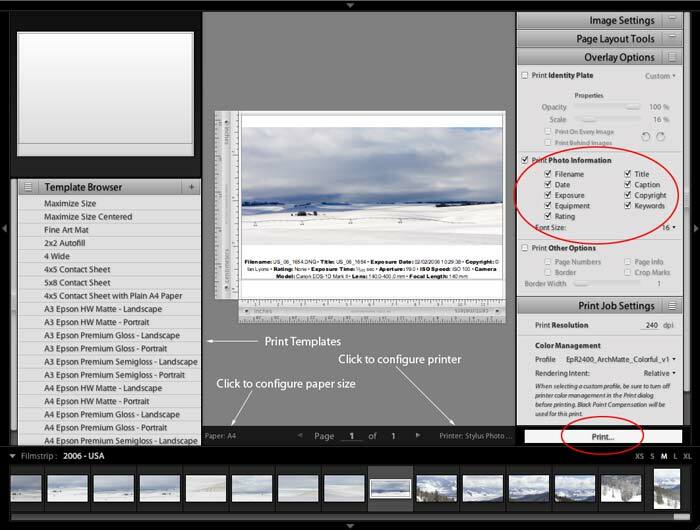 The screenshot also shows the new Photo Information options that can be printed with the image. One other thing of note regarding the Print module - it now uses the Adobe Colour Engine (ACE) with the Black Point Compensation for improved print quality. Again, I can't go into details as to why this change was made, but the improvements I see in some images are not insignificant. The earlier issue of broken rendering intents has been fixed, so I expect that many of those who had printing problems with Beta 1 and 2 will be a lot happier with Beta 3. The Web module also includes a native FTP client as shown in the screenshot below. Whilst I haven't spent a great deal of time testing this particular aspect of Lightroom I did find that it worked reliably and was fairly easy to use. If you've got this far and still feel disappointed because a "must have" feature hasn't been included, then I suggest you go back to the beginning and reread the initial few paragraphs - Lightroom is still work-in-progress. Sure, we would like the ability to rename images within the Library, have the ability to move images from folder to folder like we can in Adobe Bridge, synchronise libraries between laptop and desktop computers, provide dual-screen support, clone and dust removal tools, etc, etc. However, there are very good reasons why these features are still not available - remember the phrase: "Rome wasn't built in a day".